To some extent, podcasts owe their name to the iPod but of course, you don't need an Apple-flavored piece of kit to listen to them — they're just as accessible on a multitude of other devices as well as your desktop or laptop. There are plenty of apps and services looking to help, too. Here are the best podcast apps for Android. On Android, there's an impressive selection to work your way through as far as podcasting apps are concerned. They all offer a similar set of features but you will find some differences, so it's worth doing your research before you stick with one — and this list of the best options will provide some pointers. It has taken Google a long time to get into the podcast game but it has finally released its own dedicated Android podcast app. The app has had time to study its competition, and has taken bits and bobs from successful third-party apps to pull this off. It is super easy to subscribe and download your favorite podcasts and its discover features work well after you have spent a bit of time building up your library. One of the biggest bonuses of Google Podcast app, however, is the ability to listen across all of your devices thanks to Google Assistant. You can be listening to a podcast on the subway home and as soon as you walk through your front door, tell your Google Home device to pick up exactly where you left off. SoundWaves is the best Android podcast app for those who are sick and tired of being spammed with ads. This open-source alternative is completely ad-free and there are zero in-app purchases available. Sure, the user interface is not the prettiest out there, but it built for speed and ease of use. There is also a web player which allows you to listen to podcasts in your browser on a desktop or laptop - perfect for listening at work! SoundWaves Podcast Player also syncs with Sonos, so you can add podcasts to your home speaker system for listening to your favorites podcasts throughout your home. It will also work with Chromecast or Chromecast Audio if you like to listen that way. Pocket Casts has been in the podcasting game for quite a while now and is widely regarded to be one of the best apps of its type on iOS and Android (it also recently launched a web portal too). One of the advantages of Pocket Casts is the way it syncs your listening over multiple devices and platforms. The app includes a few clever tricks for speeding through podcasts (like speed adjustment and the ability to cut out silences) and the discovery tools are well put together too. It supports Android Wear and has been updated to Google's Material Design standards, so it's well worth a look. 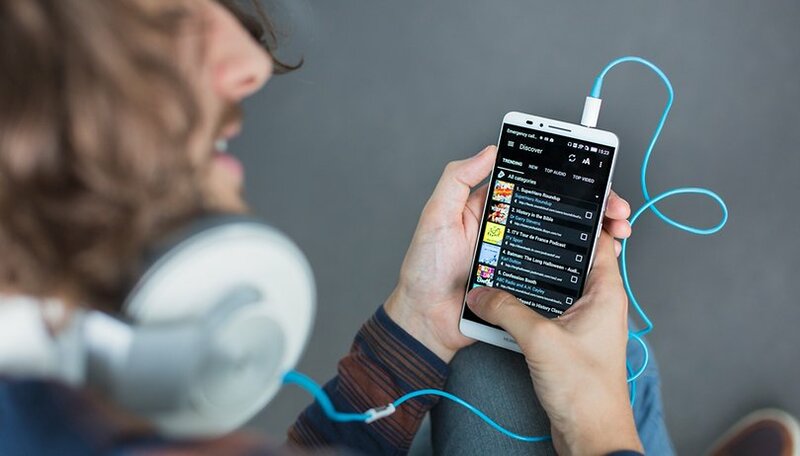 Like Pocket Casts, BeyondPod comes with a clean and enticing interface and syncs your content to the cloud so you can carry on listening from different devices as you go. Access to the app is a touch on the expensive side but there is the option of a 7-day free trial so you can see if you like it first. One of the areas where BeyondPod excels is in managing your podcasts and letting you flick through them easily, and there's a widget available as well for quick home screen access. There's also smart playlist support if you want to group particular types of podcast together for listening on the go. The interface isn't quite as polished as some of the other options here, but Podcast Republic is packed with features and can meet just about all your podcasting needs with the minimum of fuss. You can use all of the features for free and put up with some ads or pay ($1.99) to remove them. The app is well laid-out and intuitive, letting you navigate by category as well as quickly pulling up unplayed, favorite and recent podcasts. There's also the option to build up customized playlists too. There's a Dropbox-powered sync feature, plus an accompanying widget and a handy car mode view. You're going to have to pay out for DoggCatcher but if you're serious about your podcasting then you might consider such an outlay well worth it. There are all kinds of useful features here, including an auto-delete mechanism that can free up some space by erasing podcasts once you've heard them. The discovery aspects of the app are particularly well done and both audio and video can be cached to your device for offline listening. Like all of the other apps we've mentioned here, Chromecast support is included, and another feature we like is the sleep timer so you can drift off to a podcast. Pocket Casts has been running for years but Spotify has only just dipped its toes into the podcasting waters. Even though it's very new to the podcast scene, everything else it brings to the table means it's immediately well up there on the list as far as the best podcasting apps for Android go. The only problem is: The podcasting feature hasn't rolled out yet. It shouldn't be too long but there's no official date. Still, based on the quality of the Spotify app as it stands, we'd still recommend giving the podcasting features a whirl when they do finally make it to the Android app. What is your favorite Android podcast app? Share your chosen services in the comments below. You omitted Podcast Addict. I'm for 1 month in Madagascar. Dog Catcher, my usual podcast app didn't work. Google podcast neither. I tried Podcast Addict and it worked like a charm. Moreover, it's free, which of not the case of Dog Catcher. So, it will replace Dog Catcher for me. Europe occupies the second position as the tech hub of the world, after the USA. Centers like London and Berlin accounts for more than a third of the revenue that is acquired from mobile software. India is the center for outsourcing and most of its IT activities are concentrated to Bangalore, the silicon valley of India. The number of android app developers working in India account to 200K. Where's podkicker? It's a great pod catcher, too!